We’ve been waiting a long time for it! This little bar, almost hidden between high blocks of Prule, started a big hype among Ljubljana jazz, blues and rock jammers and all other-kinds-of-music lovers. It could stay unnoticed if it wasn’t for its amazing daily music program. Mondays are for classical and acoustic music events. 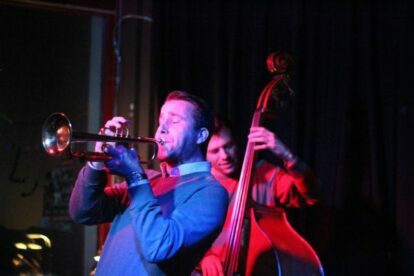 On Wednesdays jazz jam sessions attract musicians and listeners from near and far. Thursdays blues and rock fans enjoy concerts by different bands. At the end of the week, party to live popular and dance music. On Saturdays various music groups present their work. The weekend sums it up with exhibitions, art fairs or a bazaar of applied arts. But that’s not all. Prulček can boast an unimaginable assortment of beers at reasonable prices. Draughts, wheat, dark beers, pale ales, lagers and ciders from all over the world, some of them recommended by the price list. Although the bar often gets very crowded, the dedicated and heartwarming staff take care you get what you want when you want it and this makes you come again and again. During the day you can take your coffee in the big and shady garden. Because of all that Prulček soon became one of the favorite hangouts for music lovers in Ljubljana. Especially nice are the early summer evenings when Prulček hides itself in the shade and having a pint of beer feels much more pleasant, especially while listening to their daily concerts.